This continues the introduction started here. And if you read it, welcome back. Now we’re going to get our hands dirty and write some code. But first, let’s get some assumptions out of the way. I will proceed as if you have a basic working knowledge of writing synchronous programs in Python, and know at least a little bit about Python socket programming. If you have never used sockets before, you might read the socket module documentation now, especially the example code towards the end. If you’ve never used Python before, then the rest of this introduction is probably going to be rather opaque. My experience with Twisted is mainly on Linux systems, and it is a Linux system on which I developed the examples. And while I won’t intentionally make the code Linux-dependent, some of it, and some of what I say, may only apply to Linux and other UNIX-like systems (like Mac OSX or FreeBSD). Windows is a strange, murky place and, if you are hacking in it, I can’t offer you much more beyond my heartfelt sympathies. I will assume you have installed relatively recent versions of Python and Twisted. The examples were developed with Python 2.5 and Twisted 8.2.0. Also, you can run all the examples on a single computer, although you can configure them to run on a network of systems as well. But for learning the basic mechanics of asynchronous programming, a single computer will do fine. The rest of this tutorial will assume you have the latest copy of the example code and you have multiple shells open in its top-level directory (the one with the README file). Although CPUs are much faster than networks, most networks are still a lot faster than your brain, or at least faster than your eyeballs. So it can be challenging to get the “cpu’s-eye-view” of network latency, especially when there’s only one machine and the bytes are whizzing past at full speed on the loopback interface. What we need is a slow server, one with artificial delays we can vary to see the effect. And since servers have to serve something, ours will serve poetry. The example code includes a sub-directory called poetry with one poem each by John Donne, W.B. Yeats, and Edgar Allan Poe. Of course, you are free to substitute your own poems for the server to dish up. If the server is working, you will see the poem slowly crawl its way down your screen. Ecstasy! You will also notice the server prints out a line each time it sends some bytes. Once the complete poem has been sent, the server closes the connection. By default, the server only listens on the local “loopback” interface. If you want to access the server from another machine, you can specify the interface to listen on with the –iface option. Not only does the server send each poem slowly, if you read the code you will find that while the server is sending poetry to one client, all other clients must wait for it to finish before getting even the first line. It is truly a slow server, and not much use except as a learning device. On the other hand, if the more pessimistic of the Peak Oil folks are right and our world is heading for a global energy crisis and planet-wide societal meltdown, then perhaps one day soon a low-bandwidth, low-power poetry server could be just what we need. Imagine, after a long day of tending your self-sufficient gardens, making your own clothing, serving on your commune’s Central Organizing Committee, and fighting off the radioactive zombies that roam the post-apocalyptic wastelands, you could crank up your generator and download a few lines of high culture from a vanished civilization. That’s when our little server will really come into its own. You can choose different port numbers if one or more of the ones I chose above are already being used on your system. Note I told the first server to use chunks of 30 bytes instead of the default 10 since that poem is about three times as long as the others. That way they all finish around the same time. This is basically a text version of Figure 1, where each task is downloading a single poem. Your times may be a little different, and will vary as you change the timing parameters of the servers. Try changing those parameters to see the effect on the download times. You might take a look at the source code to the blocking server and client now, and locate the points in the code where each blocks while sending or receiving network data. This time the output is much longer because the asynchronous client prints a line each time it downloads some bytes from any server, and these slow poetry servers just dribble out the bytes little by little. Notice that the individual tasks are mixed together just like in Figure 3 from Part 1. Try varying the delay settings for the servers (e.g., by making one server slower than the others) to see how the asynchronous client automatically “adjusts” to the speed of the slower servers while still keeping up with the faster ones. That’s asynchronicity in action. Also notice that, for the server settings we chose above, the asynchronous client finishes in about 10 seconds while the synchronous client needs around 23 seconds to get all the poems. Now recall the differences between Figure 3 and Figure 4 in Part 1. By spending less time blocking, our asynchronous client can download all the poems in a shorter overall time. Now, our asynchronous client does block some of the time. Our slow server is slow. It’s just that the asynchronous client spends a lot less time blocking than the “blocking” client does, because it can switch back and forth between all the servers. Technically, our asynchronous client is performing a blocking operation: it’s writing to the standard output file descriptor with those print statements! This isn’t a problem for our examples. On a local machine with a terminal shell that’s always willing to accept more output the print statements won’t really block, and execute quickly relative to our slow servers. But if we wanted our program to be part of a process pipeline and still execute asynchronously, we would need to use asynchronous I/O for standard input and output, too. Twisted includes support for doing just that, but to keep things simple we’re just going to use print statements, even in our Twisted programs. Instead of connecting to one server at a time, the asynchronous client connects to all the servers at once. The socket objects used for communication are placed in non-blocking mode with the call to setblocking(0). The select method in the select module is used to wait (block) until any of the sockets are ready to give us some data. When reading data from the servers, we read only as much as we can until the socket would block, and then move on to the next socket with data to read (if any). This means we have to keep track of the poetry we’ve received from each server so far. Wait (block) on all open sockets using select until one (or more) sockets has data to be read. For each socket with data to be read, read it, but only as much as is available now. Don’t block. Repeat, until all sockets have been closed. The synchronous client had a loop as well (in the main function), but each iteration of the synchronous loop downloaded one complete poem. In one iteration of the asynchronous client we might download pieces of all the poems we are working on, or just some of them. And we don’t know which ones we will work on in a given iteration, or how much data we will get from each one. That all depends on the relative speeds of the servers and the state of the network. We just let select tell us which ones are ready to go, and then read as much data as we can from each socket without blocking. If the synchronous client always contacted a fixed number of servers (say 3), it wouldn’t need an outer loop at all, it could just call its blocking get_poetry function three times in succession. But the asynchronous client can’t do without an outer loop — to gain the benefits of asynchronicity, we need to wait on all of our sockets at once, and only process as much data as each is capable of delivering in any given iteration. 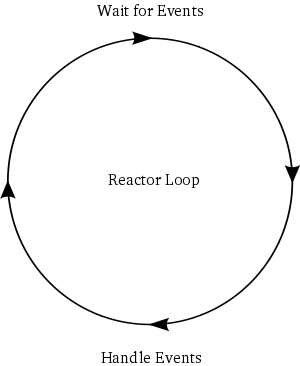 The loop is a “reactor” because it waits for and then reacts to events. For that reason it is also known as an event loop. And since reactive systems are often waiting on I/O, these loops are also sometimes called select loops, since the select call is used to wait for I/O. So in a select loop, an “event” is when a socket becomes available for reading or writing. Note that select is not the only way to wait for I/O, it is just one of the oldest methods (and thus widely available). There are several newer APIs, available on different operating systems, that do the same thing as select but offer (hopefully) better performance. But leaving aside performance, they all do the same thing: take a set of sockets (really file descriptors) and block until one or more of them is ready to do I/O. Note that it’s possible to use select and its brethren to simply check whether a set of file descriptors is ready for I/O without blocking. This feature permits a reactive system to perform non-I/O work inside the loop. But in reactive systems it is often the case that all work is I/O-bound, and thus blocking on all file descriptors conserves CPU resources. Accept a set of file descriptors you are interested in performing I/O with. Tell you, repeatedly, when any file descriptors are ready for I/O. Handle all the weird corner cases that crop up on different systems. Provide lots of nice abstractions to help you use the reactor with the least amount of effort. Provide implementations of public protocols that you can use out of the box. Well that’s just what Twisted is — a robust, cross-platform implementation of the Reactor Pattern with lots of extras. And in Part 3 we will start writing some simple Twisted programs as we move towards a Twisted version of Get Poetry Now!. Do some timing experiments with the blocking and asynchronous clients by varying the number and settings of the poetry servers. Could the asynchronous client provide a get_poetry function that returned the text of the poem? Why not? If you wanted a get_poetry function in the asynchronous client that was analogous to the synchronous version of get_poetry, how could it work? What arguments and return values might it have? I think you should explicitly point out that the async client completes in 10 seconds, as opposed to 23 for the blocking, and relate that back to the gray areas in your original diagrams. Excellent point. I think I meant to do so, but then forgot. I shall add it! i’m a absolute beginner with Twisted anf asynchronous programming, but i also looked at Stomp and Message Queue Architecture from the tutorial at “http://cometdaily.com/2008/10/10/scalable-real-time-web-architecture-part-2-a-live-graph-with-orbited-morbidq-and-jsio/”. That tutorial showcases a data broadcast (Simple Real-Time Graph) where data is produced from a “data_producer.py” launched on the server and sent to the connected client towards stomp channels (using Twisted’s LoopingCall object) every second, then in synchronous way. Now, i saw your examples, however i want to modify that code from the tutorial to realize monitoring session that broadcasts data generated from data_producer in asynchronous way, as soon as they were received from the outside world and immediately processed towards the stomp channels. I tried to modify “recv_message” and “send_data” defs and make it work, but with no success: data were generated and shown onto the stdout but not sent towards connected clients, with orbited, python stomper’s or stompservices’ example programs (stompbuffer-rx.py), etc. Can you help me to undestand with simple examples how handling Twisted functions to implement these asynchronous capabilities without using LoopingCall object? Thanks for your appreciated help. Hi Alfredo, I’m afraid I’ve never used the Stomp protocol, so I’m not familiar with those libraries. what if all servers client connects to, are fast, i.e. sockets can be read always without waiting for data. Then a blocking client would be as fast as non-blocking, right? If so, would it help to run downloads in threads? Sockets that can always be ready are really fast sockets 🙂 But in that case a blocking client would never actually block so it would be just as fast. At that point multiple threads could help (on a multi-core machine), though keep in mind that Python has some limitations in that area. Multiple processes are another option (again, assuming you have more than one CPU). I’m following your tutorial, and I’m confused by your third suggested exercise. Can you explain in other words what you mean by having the ‘get_poetry’ function work in an analogous way? Are you referring to the possibility of turning it into a generator that yields poetry as soon as it receives it? Hi Lucian, pondering what ‘analogous way’ might mean for an asynchronous version of the client is really the point of the exercise, and I’m not claiming there is one right answer. It’s a thought experiment, not a call for working code. Later Parts will show what Twisted’s answer is, but a generator is certainly an interesting direction to go in. re-worded the question so hopefully it’s a little clearer. analogous to the nucleus when you map the solar system to the atom. the solar system to the atom. would the arguments and return values be? How would it work? Ok, Dave. Thanks for the explanation. I believe things will become clearer as I move forward with the tutorial. Am I correct in saying that in the async client, the following line doesn’t really do anything? Not quite. It makes a new list with the same elements as the original list passed to the function. Dave the above fix also needed to be applied to the async host to get it to work on windows. hi Dave, nice stuff. Altho I can’t actually get the example to work (on OSX 10.6). three to run a server, and one to run the client. Does that make sense? Completely and totally. (And it works!) Many thanks for your being the kind of genius that can answer the simplest questions well (hardest kind). Thanks for the great tutorials! I’m learning a lot. I had one question though — where are the poems supposed to download to? I tried looking for them to verify that everything was working right, but I couldn’t find them. Hi April, the clients just get the poems from the servers, but they don’t store them on disk anywhere. The later clients print them out so you can see they were downloaded. a perfect intro to async matters. Lets say a server is ready to dish out 2000 (> 1024) bytes, wouldn’t we keep calling RECV on that socket, without breaking out of the loop, since bytes is being appended to. Hi Nishith, with this particular client it would loop around and read some more bytes, just as long as there were bytes ready to be read. But once we had read all the bytes that were available, we would get a socket exception with EWOULDBLOCK since the socket is in non-blocking mode, causing us to break out of the loop. Now in a real program, you would want to limit the total number of bytes you read in one go, to avoid a really busy socket from starving the others. Thanks Dave, it makes sense now. Excellent tutorial! One of the best I’ve ever seen! I use Inkscape which is a lovely tool for creating figures. Serving poetry/ecstasy.txt on port 39786.
you are running, and the complete traceback including the error message at the end? Thanks, and glad you like the tutorial. Hi Dave and thank you for your fast reply. and then nothing more. Changed parameters for how many bytes or time don’t help either. Are their ports I could try? I have Tor installed, maybe (even if I can’t explain it) that has something to do with it. out the poem (and the poetry server will print out a line as it sends bits of the poem). Thank you Dave. I really missed that point 🙂 You’re my todays hero. Wow, thanks for your tutorial Dave. It’s very practical and also very creative. I love the way the developers integrates other things like philosophy, literature or mathematic … into the program. Again beautifully written but I am not sure what we have to do in 3rd exercise . To make it like analogous to sync way , it must have a loop(that’s what i think) to make sure that all sockets are closed(.i.e all poems are read). As per arguments , I think we should pass the starting point from where the poem have to be read , which should be initialized to zero in starting and then after each socket.recv(Bytes) , it should be updated according to number of bytes read so far . And it should return the bytes (data). Am i right or missing anything ? unless you really want to give it a try. as much as it can, returning those bytes? a function that conceptually would return the whole poem, but was asynchronous? Twisted’s answer to that question is coming in the next series of Parts. Hi Dave! Thank you for this tutorial! 1) If I comment out line #105 (sock.setblocking(0)) nothing really changes. The client works in exactly the same way, at least as far as I can see. Could you please explain what parts of the code this line should affect? How do I start the servers (i.e. what options do I use) to see the effect of this line? 2) I also don’t understand lines 71-78. I have removed exception handling to see the exception itself, but it was never thrown. Hey Umi, glad you like the tutorial, and great questions. data to be read. It might behave differently on another system, but I don’t know for sure. and see what happens. Try setting the server delay to a long value like 10 seconds too. inside the loop (for sock in rlist) we can have multiple sock.recv(1024). Please correct me if I’m wrong. Once more question is, when errno.EWOULDBLOCK is caught, the task will finish and be removed. Whereas I think EWOULDBLOCK means the data is temporarily unavailable and we can comeback later. Again, please correct me if I’m wrong. And great tutorial by the way. Much appreciated! Hey Vu, you are right, that is the correct meaning of EWOULDBLOCK. In this case, however, because the select call has identified it as ready for I/O, the first call to recv will never block. A former version of the client had an inner loop where it was actually possible to get the EWOULDBLOCK exception. I think I will put it back in, minus a former bug 🙂 This version will hopefully make more sense, since there is an inner loop that tries to recv() from the socket multiple times. Dave, Thanks a ton for your post. You are welcome, glad it was of help to you! Excellent tutorial ! Thanks a lot ! Plus a fantastic tutorial, thanks Dave. Thanks Dave. It couldn’t get any easier. For the second question in the exercise section, for get_poetry to return text of each poem it has to return/relinquish control. That would break the reactor loop as it is coupled with business logic, and no sockets are monitored for reads. Am I making any sense..? Thanks a lot Dave, couldn’t get any easier. I guess the reason why get_poetry() cannot return text of each poem is that the function would have to release control hence breaking the loop as both the reactor and business logic are tightly coupled..? I think you have it — the function cannot return the text of the poem because in order to do so it would have to wait for all the text to arrive and thus would be a blocking function. Correct me if I’m wrong. But you’re saying that because we do not how many servers the client will contact, the WHILE loop is necessary. If we knew definitively that there were 3 servers, then we’d only do 3 calls, or a WHILE i<3. Is that accurate? Thanks again. Pretty much, I’m saying that the synchronous client needs a loop (it could be a for loop) simply because the number of servers to contact isn’t known to start with. The asynchronous client needs a loop even if the number of servers is known in advance. (this is extremely minor) in async-client, you are using reverse logic on the if statements. Agreed, that’s a good point. And cognitive research backs you up! I tried get_poetry.py in one terminal and used the client.py in another. In get-poetry.py , after the poetry is sent completely it dosen’t exit the program. If i use Ctrl-Z to exit the program and try it again it shows errors , then i have to restart my terminal to use get-poetry.py . Any fix for this? Thanks! It’s hard to know what’s going wrong without some output, could you show the errors? I don’t know of any bugs in the client. My question is regarding data = “” in async-client/get-poetry.py file, are we not getting all data from three sockets into same variable which might corrupt the data it stores. Seems that’s working fine ,but not sure how. Could you pls shed light on it. Sure, the data is only read from on socket at a time, and the poems dictionary holds a mapping from socket numbers to the poetry data. That’s how they are kept separate. hi dave , thanks for these really nice tutorials. # blocked if the socket was blocking. Here in the code we declare an empty string // data=” ” // and then later in the loop we check // if not data // my question is if the condition satisfies then why the socket comes in the rlist in the first place , is there a different between socket with no data to read and a socket which is not ready to be read. Hi there, so the if not data check there is handling the case where the socket has been closed. I also have a similar doubt, let me break it in to multiple question. 1> A socket will be added to rlist after select unblocks in case of i > Any data is ready to read and also ii> In case the socker is closed ? Because in this case only (if not data: ) scenario will come, where there is no data to read but socket is closed from server end. 2> When this condition will be checked ? Because this else part comes if a socket is ready to read and there is no exception as it’s not blocking for that socket. So i am basically confused about this two cases ?